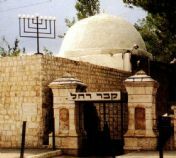 Rachel's Tomb, a site sacred to Jews for many generations, is managed and maintained exclusively by the Ministry of Religious Affairs and the National Center for holy places. Rachel's Tomb. The Jewish Second Holiest Site. Since the time of her burial- more then 3000 years ago, the Tomb of Rachel has always been a special place for prayer. To this very day, men and women go to Rachel's Tomb to shed tears and beg "Mother Rachel" to intercede with G-d on their behalf -- for the health of a loved one or for Divine Intervention for those in need. Rachel, the childless woman who ultimately became the mother of the Jewish People, has become a special symbol of hope for childless women, and all those in need of special blessing -- teaching them the power of prayer. Hundreds of requests are sent every month to "Mosdos Kever Rachel" from Jews world wide, requesting prayers to be said on behalf of the ill, the childless and those in need of a special blessing. Rachel's Tomb is a living symbol of HaShem's promise to Rachel that her children will return to the Land Of Israel. Jewish life today thrives in Rachel's Tomb. In these days, despite the on-going war of attrition, Thanks to Mosdos Kever Rachel people are still going to recite Tehillim (Psalms), pray and learn Torah. Classes given by renowned Jewish speakers are held there. Rachel's Tomb has also become a place of joy as Britot and Bar/Bat Mitzvah celebrations are held within its walls.